martha.anne - living through creativity: The Future Mantel… So Excited! 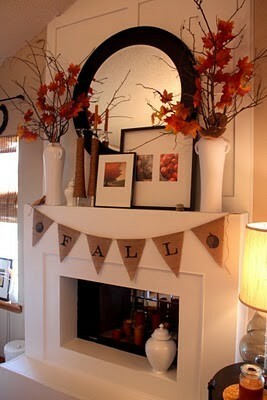 The Future Mantel… So Excited! I can't tell you how much I miss having a mantle to decorate this Christmas… let alone year round. I have so many things I want to display and no where to do it. With the open space concept, I don't want lots of clutter and I've been begging the hubby for a mantle. We are thinking of doing the basement over and putting a propane fireplace down there and since the upstairs will only be used as a sitting room while cooking dinner or a family hangout formal room for the holidays, we don't really see the point of putting in an actual fireplace. But, that doesn't solve my problem of wanting a mantel. I'm in love! Need I say more. Okay, so I think this is a real fireplace (the hubby and I have been debating that), but that doesn't matter, the design is perfect and we're thinking that putting candles in it will work perfectly. Like I said, it's only for decoration… not use. Gah.. I can't wait. I'm actually torn on whether we should wait any longer. There are three weeks until we can say Christmas is actually over and we can tackle this project. I'm not sure I can wait any longer. We actually pulled this picture out at every commercial break the other night and analyzed every part of it. I think it's going to be the first piece of character that we'll be adding to the house. Trust me, I have a list raring to go. Anyways, enough of that… come back tomorrow… I have another free photo card for you. The one I told you about the other day during the Free Printable Christmas Photo Card post. Free Printable Christmas Photo Card!